EDIT: as you can see, there are several 'revisions' now, but they are all only about Syaoran's hair color. I received quite a lot of complaining about it on deviantart, since it seems like most people are used to the dark brown of the tv series, so I made variations. The darkest one is obviously the anime version, the 2 others are different shades from more manga pictures by Clamp (the 1st version I uploaded is also from manga illustrations), I really just use the eyedropper tool and make slight changes for them to fit better together, I didn't invent anything. As usual, things ended up being a lot more complicated than they seem at first. I thought: "well, I just have to find the right faces for them and cut/past!"....not. How naive I was ;_; Finding the right pics was hard and in the end, since nothing satisfied me completely, I ended up combining several scans and redrawing the parts I wasn't happy with. The one who underwent the heaviest editing is Tomoyo: her eyes shape are actually from a TRC|Sakura scans, her hair is a mix of my redrawing and the K-on! character scan, her face is my redrawing too. (the others characters were easier since I found better scans for them and adjusted them accordingly). Tomoyo's camcorder is from TRC too~ I also made a pairing item between her and Sakura in the form of the hair accessories. Well, beside that they are changes a bit everywhere, some more visible than others, but I won't start listing everything. That said, I will seriously start saving for a tablet, I don't think I can go any further than this with a mouse. If you like it and have time while passing by, please review and +fav! THANKS! Browse Cardcaptor Sakura Gallery: Recent | Popular. I really impress with this work. Everything looks fit in this wallpaper. I understand the difficulty of this one. You must really put your effort. Anyway, thanks for sharing. Good Job! 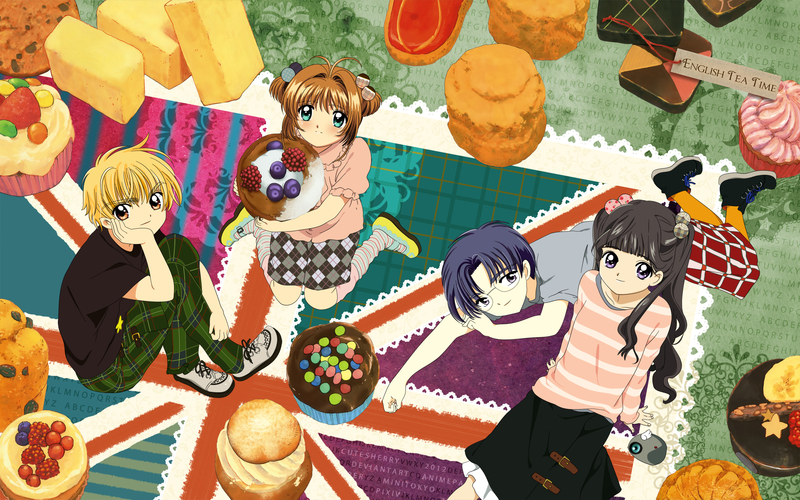 They all picnic to Eriol place and have big cakes, I'm jealous. Woaaaahhh! Absoutely love it! looks awesome, thank you so much for sharing! Thank you so much for your effort, this wallpaper is going to be in my pc for a long long time, they just look so cute and natural, all of them! i really like the way u presented the 2 guys...cool. and the 2 girls cuteee..
Oh this is so adorable! Thanks a lot!